First there was one. Now there are two. One Christian. One Muslim. Yew! 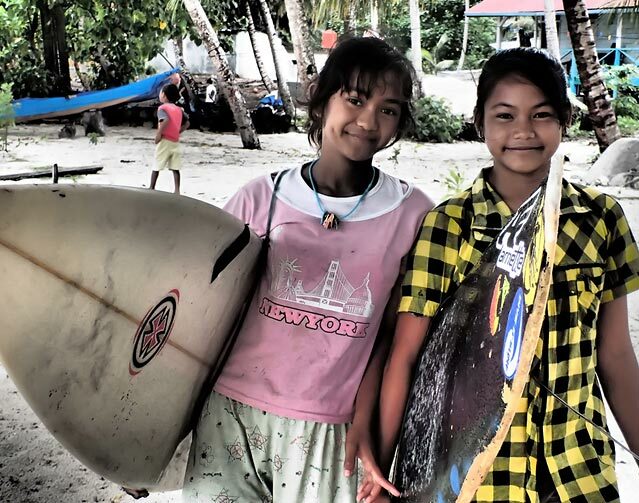 Ike, the first girl ever to surf from this area now has another girl to paddle out with. Fitri can now surf and is as hooked as Ike! The girls, who both come to English class, can’t wait to grab a board and get out in the waves as soon as class is over. They even say to me “Come on Lizzie. Let’s go surfing!” They are already paddling out at Hts, the main local wave, on small days and catching a few rides over the shallow reef, completely fearless and undeterred. Some of the older local boys are helping them out and pushing them into waves, fully supporting them surfing. Unlike the majority of locals in Katiet Fitri is not Christian. She is Muslim. There is a very small Muslim community in Katiet. It’s wonderful to see two girls, one Christian, one Muslim sharing the enjoyment of surfing together. Other girls are now coming forward keen to have a go, seeing how much fun Ike and Fitri are having. Ike and Fitri are gaining in confidence and their health, both physically and mentally is benefitting. They are far more relaxed in the water and stonger from all the paddling than six months ago when they only went in the ocean from time to time. Hopefully their connection to the ocean will develop a care-taking attitude towards it, providing an example for others to follow. For footage of the girls surfing and interviews with them check out the Youtube link on the website and go to Ike and Fitri.